Obedience is a choice. It is a between our own limited knowledge and power, and God’s unlimited wisdom and omnipotence. God has a reason for everything. 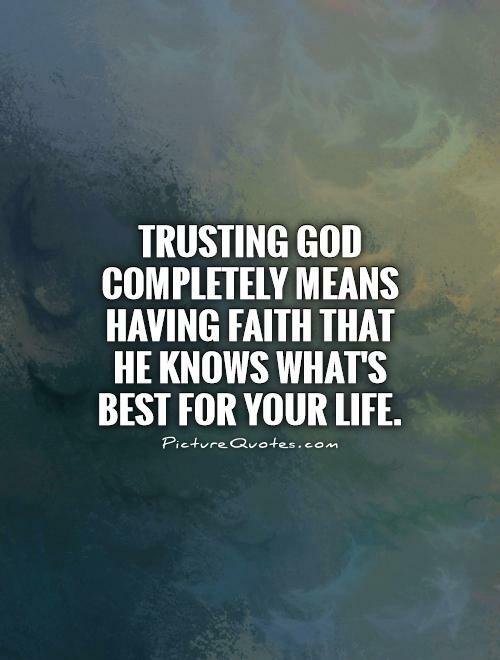 He does not need us to understand, He wants us to have faith and trust in Him. I mentioned the other day that trust is built. There are some people who say they trust others until they are given a reason not to trust, but this is isn’t true. Our human nature is not prone to trust anybody, much less at a 100 percent rate. Trust is developed, it is cultivated like a garden. We can have faith that God exists, but do we have the faith to believe that we can move mountains? What do you need to move a mountain? Jesus said, if you have faith the size of a mustard seed- you can say to this mountain be moved, and it will be moved. But the mustard seed tells us something extremely important about faith in trust, and our ability to push past our problems in life. The mustard, like any seed serves a purpose, this being to be sown and to bear fruit. The Bible says, faith is like a tree, which provides a home for the birds nests and other animals to rest. This is faith: provides rest, and certainty. This is why Jesus said to the disciples that if they had faith, they would be able to move mountains. Because faith grows up. There is believing faith, then there is a faith that is developed and cultivated over time. Faith produces rest, and certainty in our lives. For example, when we face some sort of trial with faith- we face it, and go through it IN FAITH. As faith is cultivated, we develop into new people and our lives are changed. It may seem a hard task to trust in something you cannot see, but God will make Himself real to the people who are sincere with Him. If you draw closer to God, He will come close to you. You can do it, every day is a new day to build a stronger relationship with God. Lord Jesus, thank you for our spiritual growth. I thank you for your continuous work in our physical and spiritual lives. I present our minds and hearts, may you continue to nourish us by your word. May you help us to increase and cultivate our faith, as we see your love and faithfulness operate in our lives. May you open our eyes to see your mighty works, and may you give us the revival our spirits desire to defeat any discontentment, hopelessness or bitterness in our lives. May you Jesus renew each person’s faith to believe and expect from you again. In Jesus name, Amen.